I discovered the art of iterated function systems (IFS) in a fractal mathematics course during the summer of 2015. Having no background in visual arts, this opened up a weird new world of expression to complement my endeavours in music and theatre. As an occasional maths and science teacher, I could always use fresh reasons why a young person should take up mathematics. With these pictures, I hope to make a strong case for artistic fascination and dismantle the cold, hard image of science. This film is a demonstration of my graphing methods for iterated function systems (IFS). In particular, my method combines the different steps of iteration into single graphs. This way, the choice of the initial set has a clear effect on the resulting picture. 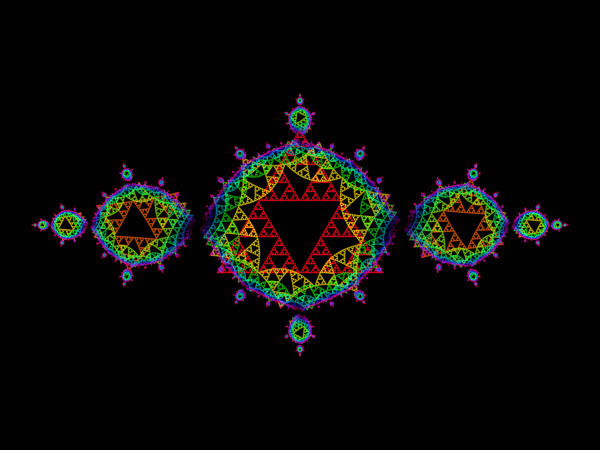 The function systems come from the classical Julia sets of the complex polynomials z^2 + c. During the course of the film, the parameter c surfs about the Mandelbrot set, and a range of very different initial sets is explored. The surfing metaphor is enhanced by an instrumental rock soundtrack, synchronized with the rocking motions in the graphics. The result is a kind of mathematical music video, rather than a purely technical or educational demonstration.